Tensile strength, fatigue strength and ductility are important properties of nanostructured metallic materials, which make them suitable for use in applications where strength or strength-to-weight ratios are important. Nanostructured metals and alloys reviews the latest technologies used for production of these materials, as well as recent advances in research into their structure and mechanical properties. One of the most important issues facing nanostructured metals and alloys is how to produce them. Part one describes the different methods used to process bulk nanostructured metals and alloys, including chapters on severe plastic deformation, mechanical alloying and electrodeposition among others. Part two concentrates on the microstructure and properties of nanostructured metals, with chapters studying deformation structures such as twins, microstructure of ferrous alloys by equal channel angular processing, and characteristic structures of nanostructured metals prepared by plastic deformation. In part three, the mechanical properties of nanostructured metals and alloys are discussed, with chapters on such topics as strengthening mechanisms, nanostructured metals based on molecular dynamics computer simulations, and surface deformation. Part four focuses on existing and developing applications of nanostructured metals and alloys, covering topics such as nanostructured steel for automotives, steel sheet and nanostructured coatings by spraying. 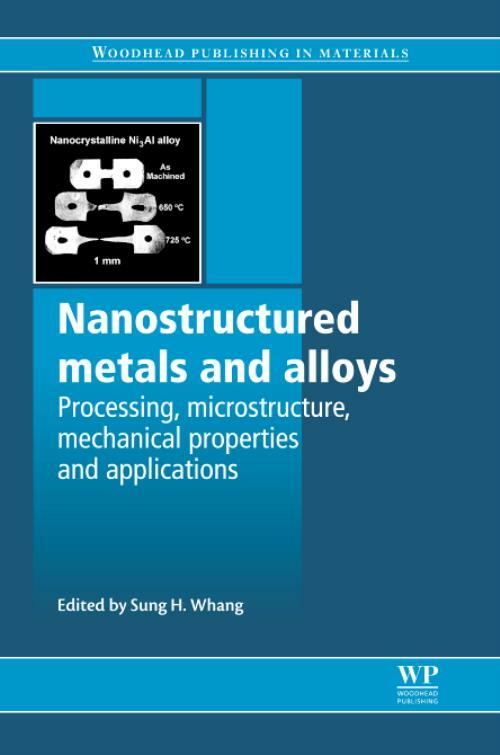 With its distinguished editor and international team of contributors, Nanostructured metals and alloys is a standard reference for manufacturers of metal components, as well as those with an academic research interest in metals and materials with enhanced properties. Whang, S HSung H. Whang is Professor of Mechanical Engineering at the Polytechnic Institute of New York University.